Instrument P.I. : Richard Spalding, Sandia National Laboratories. Technique: High-speed (250,000 samples/second) Silicon-based photometry. Scientific objective: To measure the total radiative output of the SRC during entry in the 380-600 nm band and the 600-900 nm band and detect rapid fluctuations of light output from spacecraft rotation, instabilities in the shock layer, and ablation. Instrument: This instrument consists of two photometers, each equipped with a filter of choice: here a low-pass and high-pass cut-off filter. Each photometer measures the sky over a large �15 degree field of view, at about 5 - 35 degree elevation. 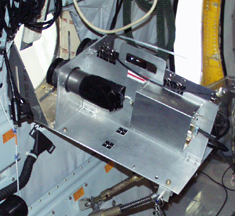 Heritage: A slower but intensified photometer was deployed onboard the 2002 Leonid MAC mission for high-speed lightcurve measurements of meteors. Aircraft hardware requirements: Fixed mount. Computer and control unit in rack space. Instrument validation tests: The sensitivity of the camera was tested in night-time observations of Venus and other astronomical sources. Sensitivity: The total combined filter-lens-detector responses was 0.18 A/W/cm2 for a 10-nm wide filter centered at 870nm assembly and 0.11 A/W/cm2 for a 10-nm wide filter centered at 656nm. Estimated sensitivity for broadband: 1 A/W/cm2 for 400-600 nm, and 5 A/W/cm2 for 600-900 nm. Frame rate and exposure times: 250,000 samples per second for each channel.